Its not a bad size, maybe 18ft by 60ft, and the soil is ok where its not stony, and I really wish I could get it into a shape where it could be quietly productive for me, but I need some inspiration and advice given that a) I have no money to have terraces put in professionally and b) time is also in very short supply, I usually have only a couple of hours a week that I could devote to the garden. Has anyone here managed to tame a similar patch without going insane? I have toyed with the idea of using the stones to create random raised beds, which would give me level planting pockets that I could add to one at a time and make everything in between them into path- but starting is another matter. Probably not quite what you want though. 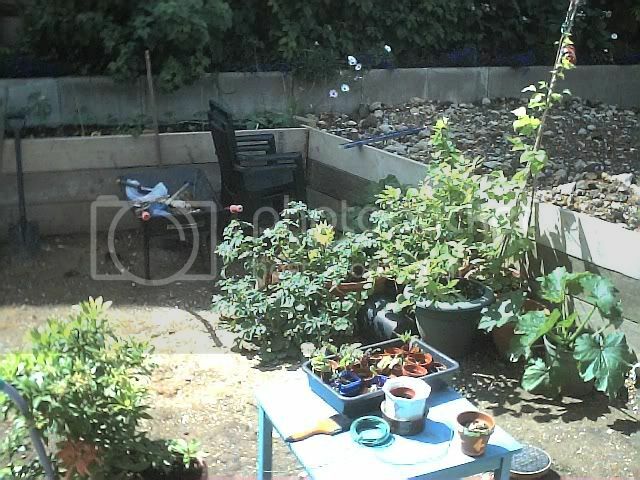 Our garden's a long thin suburban thing, at best a foot of soil on top of chalk cliff. If you stand at the top of it, you are above the top of the house, I think. So it's quite a slope, but over a longer distance than yours (I think) therefore probably not so steep. The first year we removed turf and brambles and buckets and buckets of flint and stones, making 3 then 4 narrow beds in a row. I think we then added to that the next year, and claimed another patch of land. Then put in a greenhouse which involved stealing a levelish patch and a lot of levelling by TD. To make up for the lost space we dug out the paths between the remaining beds to make one veg patch. Then we cleared a very overgrown, brambly patch, similarly full of stones...and planted it with potatoes the first year, peas and squashes and beans the next...not sure what's going on it this year, but it now also contains apple trees, and will have grapes and strawberries this year, as well as rhubarb down one side, so it's slowly edging to being a fruit patch with the idea that when we sell up eventually that will (a) be attractive to purchasers as it will be productive but nothing to mow and only a bit of maintenance (b) discourage them from doing what the neighbours both sides have done, which is finding the ugliest possible way to turn their gardens in to a desert. How much does the garden slope? Ours, I think, is about 1 in 4. We've not decided to terrace as it would cost a fair bit and we seem to be able to cope as it is. Much more of a slope and we would start to have problems, but anyhing can be overcome. Bugs, do you start from the top of the slope or the bottom? 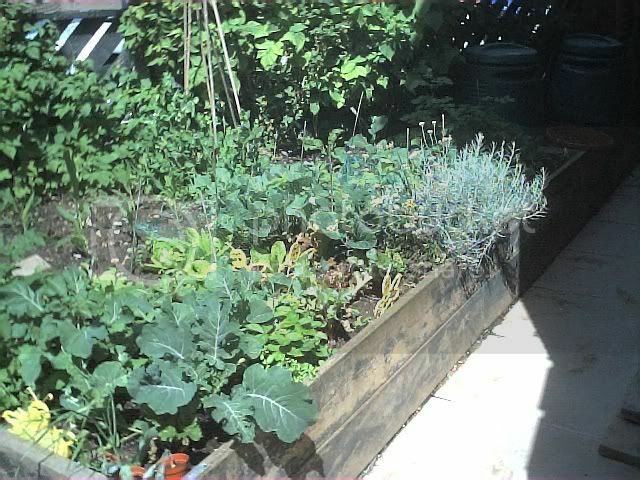 I am terracing my veggie patch with old scaffold boards, but its only a small slope. I'm only doing it, cos it drove me mad that every time I dug or planted something, all the soil ended up on the path! I'm also starting to feel positively lucky about the (natural) state of my garden! Although I have a horrible suspicion the nest one is on solid chalk! I'll know where to come, anyway! We dug a channel (well David did ) put in the boards at the back first then worked our way forward to level it.We are almost ready to turf now just need another skip first! They look great. I'll have to get the hammer out! Just need to nick himslelfs car to go up to the woodyard - its bigger than mine!